Acoustic Audio by Goldwood High Definition Series HD518 5.1 in-wall/ceiling speaker system. This system is perfectly matched and consists of: (2) rectangular front in-wall HD speakers, (2) round rear in-ceiling HD speakers, (1) dedicated true center channel in-wall HD speaker and (1) 10" in-wall HD subwoofer. This is the ultimate entertainment package to build your very own home theater surround sound system. The speakers mount seamlessly into any wall or ceiling, so they won't take up precious shelf or floor space. 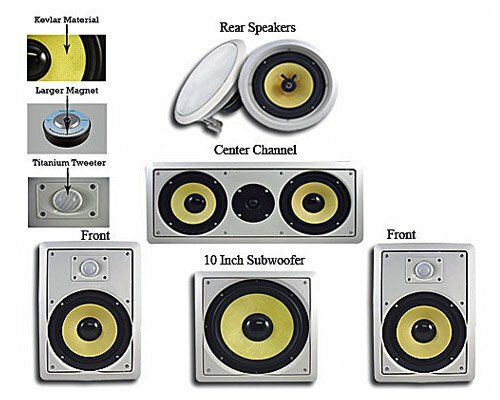 Each speaker has been designed to provide the best sound quality. The entire system can handle 2,050 watts of power and features authentic 8" Kevlar cones, butyl rubber surrounds and titanium tweeters. Installation is easy because of the speakers' quick-turn mounting arms. The grills are white and can be painted to match specific decor. Speaker wire is included. This package comes with a non-amplified subwoofer. This subwoofer will need an external amplifier for use.